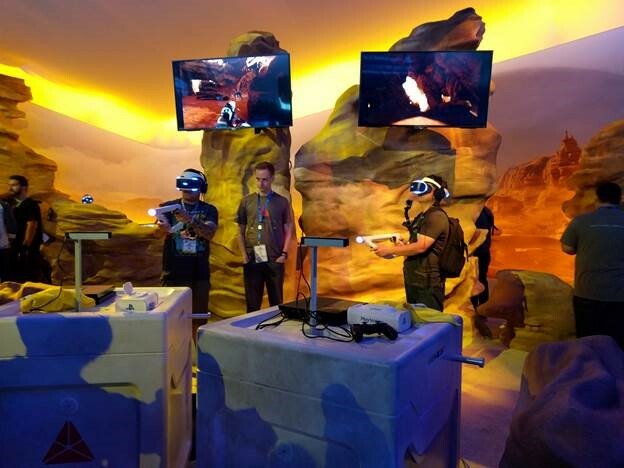 Playstation VR Farpoint with Aim Controller. Unfortunately, I didn’t get into one of these demos, but people walking off seemed to really enjoy the experience. They said that holding the riffle made a big difference, and the objects being in your face was causing people to dodge on instinct. 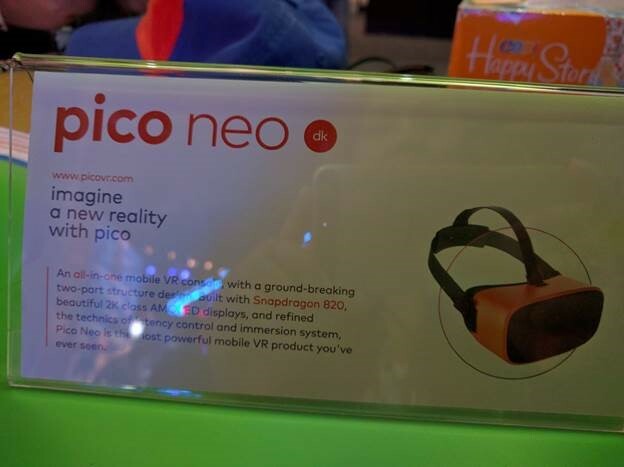 This has changed since I’ve has last tried it at PAX last year. The viewpoint for the eyes are no longer a rectangular square with a separation barrier between the two. Instead it is two circular lens for each eye to look past. Pin Ball, just like a real PinBall machine you are standing over it, well actually you are standing way over it and your chin had to be against your neck to look at the bumpers (some good feedback for the developers). Trigger buttons on the PS4 controller worked as the bumpers. Ok decent game. 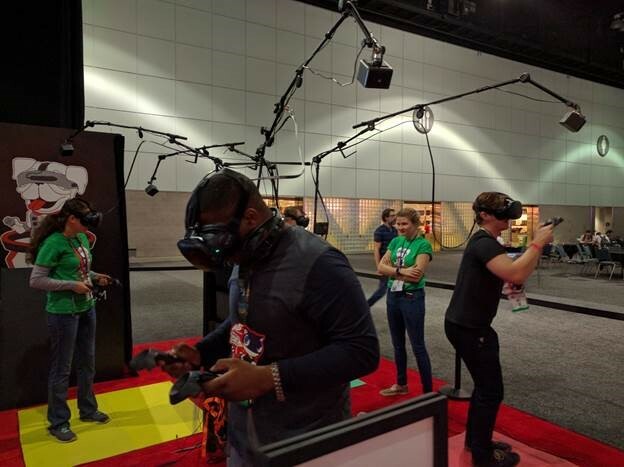 Shooting Zombies, you aim with your head tracking, and shot by tapping the trackpad on the side of the Oculus device. Wow I’m actually pretty decent at shoot games now. Though I wonder if holding my hand up against my head for long period of time will be tiring or not. Space Ship, my viewpoint is of a person flying the spaceship from inside. So if I looked left and right I was only looking left and right inside my ship to look at the controls. To move the ship I still had to use the controller to move the ship. Having two motions of moving left and right was confusing and frustrating, you can look left, but your ship turns really slowly to head left. I thought the controller took away the illusion from the experience. In general, graphics were a little pixelated. I could never get full focus, 80% of the screen would be clear with pockets of fuzzy (I wonder if it’s because I have astigmatism). Reading text on the screen wasn’t that great. I had a major problem that every time I started up a new game, my center had moved. At one point I had to play the game slanted because my center had rotated. 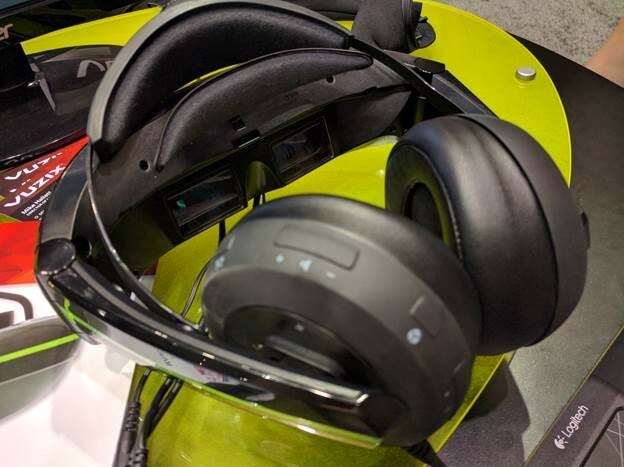 The Touch are the duo controllers for the Oculus. Very Comfortable, pretty easy to use. I played PvP game where the human stands on a hoverboard in front of a goal line and we throw the disc across the field to get/save the goal. The rules were a mixture of ultimate Frisbee and Pong, with a theme similar to Tron. To move was to lean left and right like on a snowboard. Because of how much I moved in game, it felt like my play space was much larger than it really was as I never actually moved my feet from their placement. In game, the controllers were displayed as your hands, you moved your arms and wrist in the same motion you would as throwing a Frisbee. 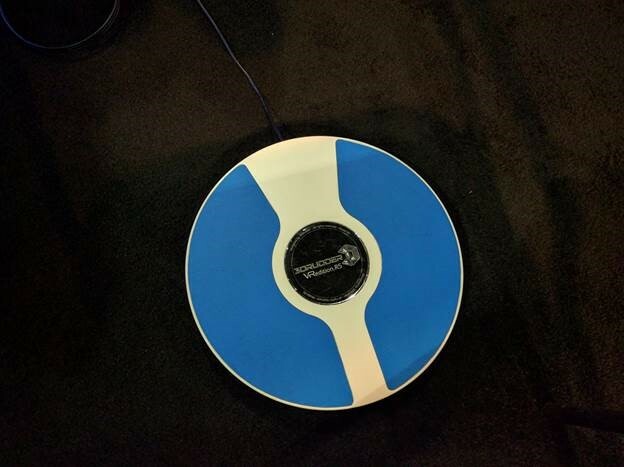 The buttons were used to grasp and let go of the disc. Playing and watching others play the game, some people were very comfortable playing the game immediately, while others had difficult time with the throwing and catching. I was excited for this game, but this ended up as a disappointment. They gave me a Dualshock 4 Controller. When you have to move your head AND use the analog stick for moving, that confused the crap out of me. In the game, Raz can put his mind into other people’s brains and control them. And that’s what it felt like, I felt like I was inside someone else’s head and I could see through their eyes, but I couldn’t control them naturally. The controller completely broke the immersive experience. 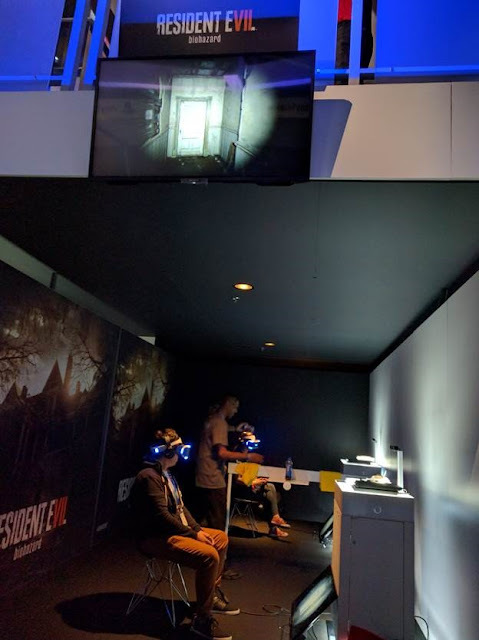 Lots of people hung around the Resident Evil watching others play. 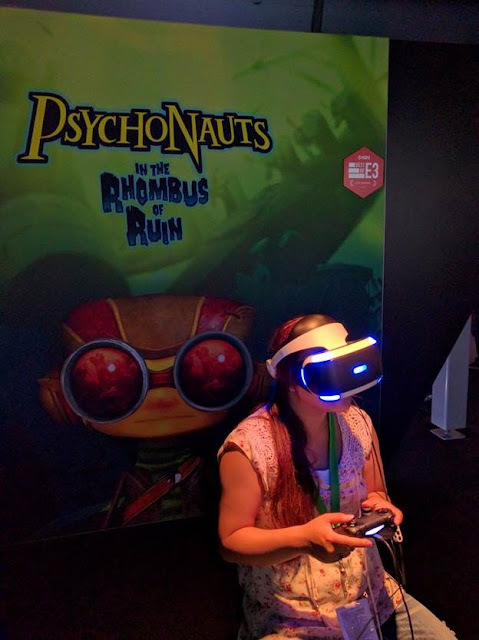 Over and over I heard the question, “Would you play this game in VR”, and everyone said NO! And watching one of the players scream randomly I’m so glad I’m not trying either. 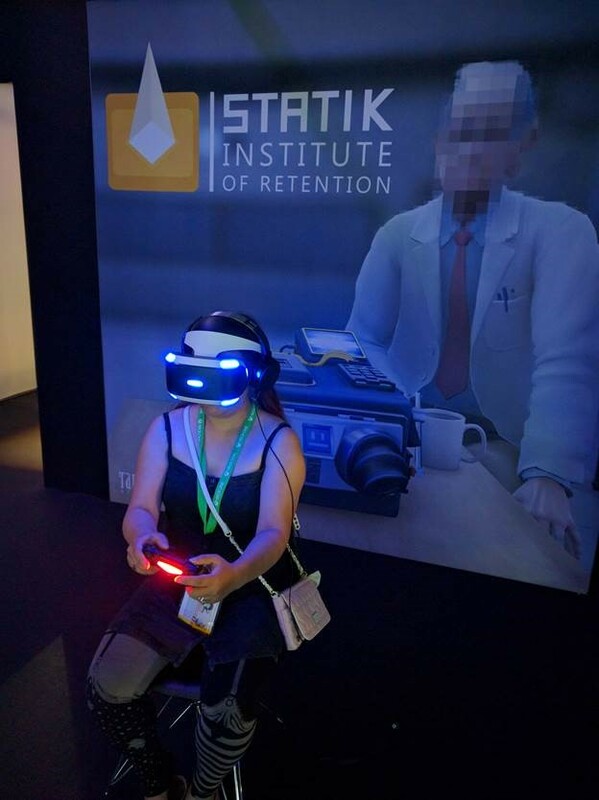 Just when I lost faith in VR with controller experiences, Statik impressed me. 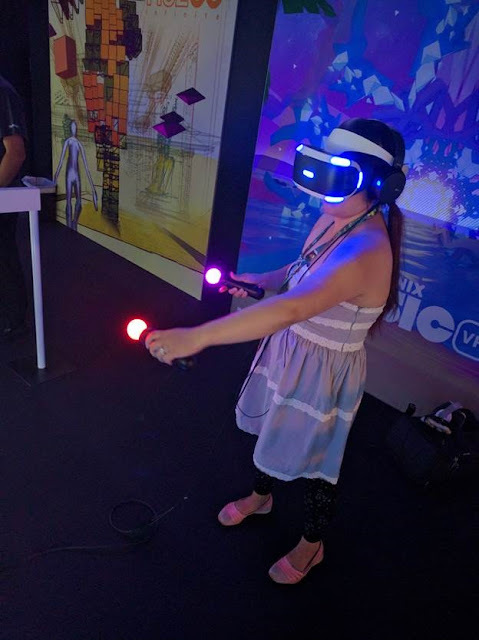 Similar to my thoughts on why I like the Vive controllers (I guess you’ll have to read farther down), the developers of this game made the placement of your hands on the controller positioned in the game as part of the experience. 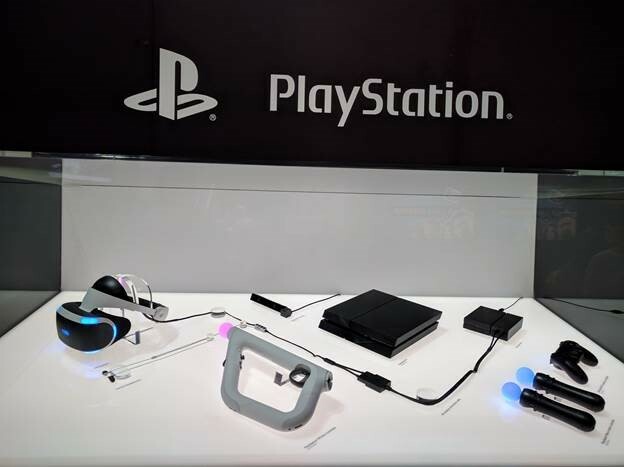 Within the game your hands are locked inside a box bounded by the controller’s physical size, the PlayStation Move camera tracks the controller so even if you move your hands with the controller, it follows in the game appropriately. The graphics were cartoony, so the graphics didn’t seem lacking. Only 20% of the people who played the game figured out all the 5 puzzles in the 10-minute time frame, YAY for me I got it in 7 ½ minutes. 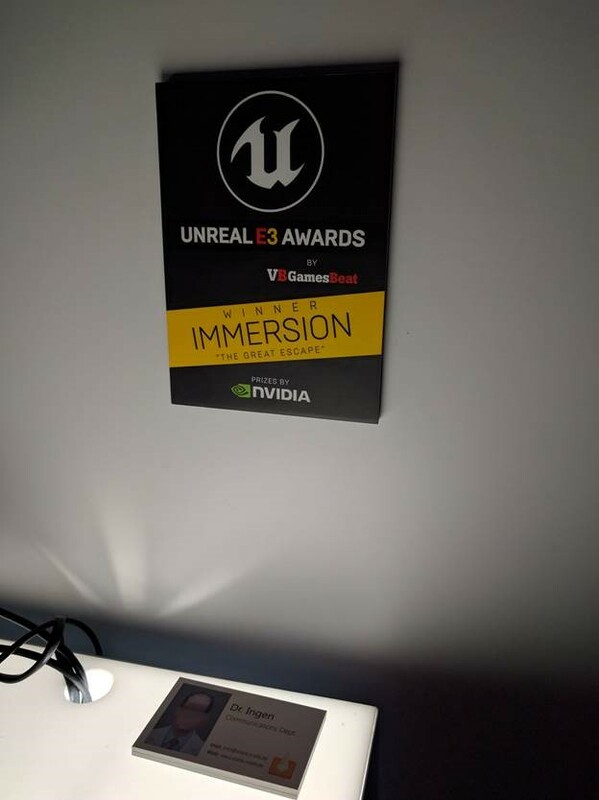 When I was finished my demo, folks came up to put up a place card that this game won an award for “Immersion”, I agree it was well deserved. 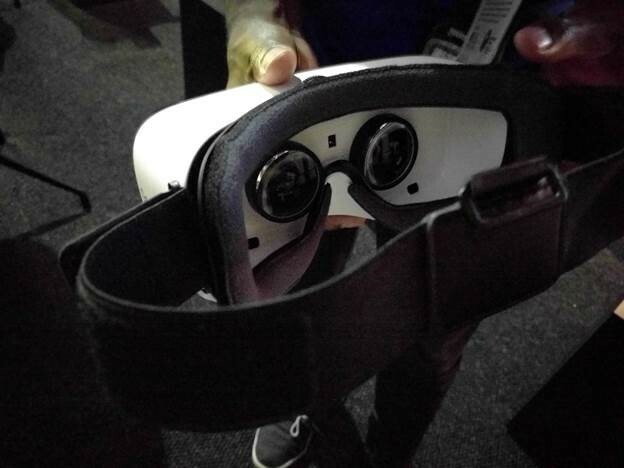 Look at that brick attacked to the VR headset! 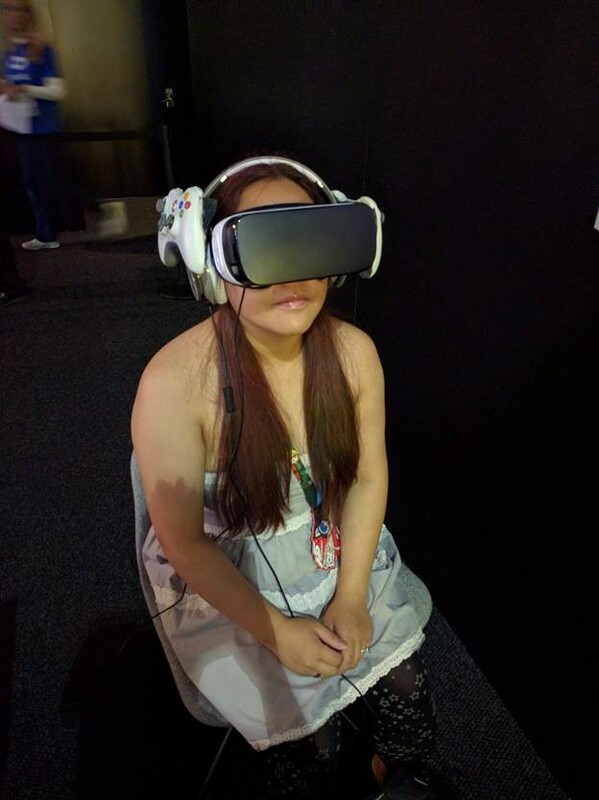 Ok this isn’t quite VR, but it’s rather immersive. 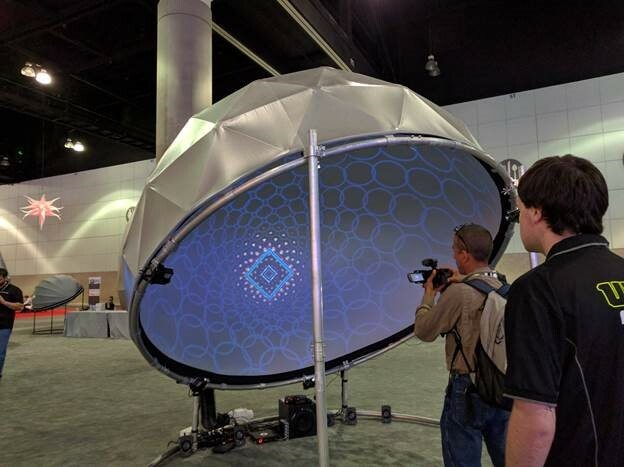 Your whole screen is a dome around you. The small one here hopefully gives you a good sense of how it looks. 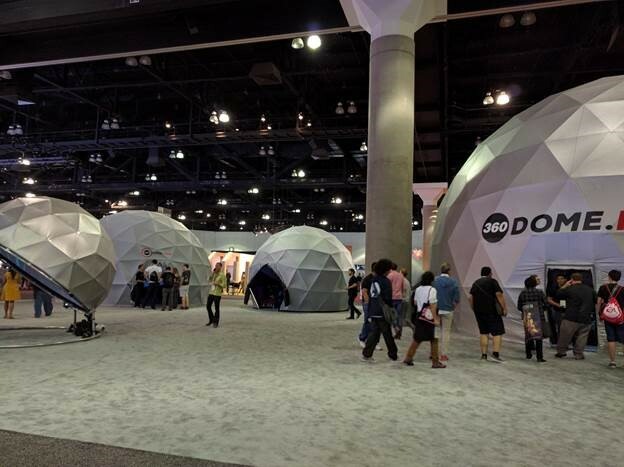 But when you are inside a dome that fits 10-40 other people with things projecting all around you, you get very lost into the scenery it provides. It’s basically like a planetarium, but more personal. They weren’t advertising this to be a home product, but more for corporate events or learning environments. I watched a film of a skydiver jumping off a plane, and what it looked like to be spinning free fall, then moved to a flight video from a bird’s view. HD quality was amazing, and just relaxing to enjoy like an Imax experience. Ok this product personally annoyed me. It was a complete rip off the Oculus line. 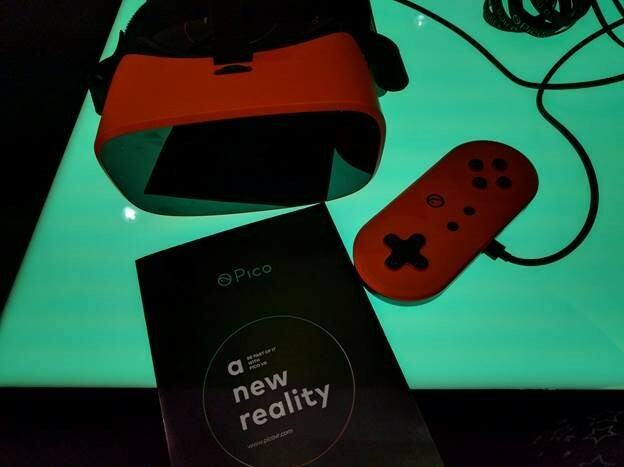 The way that it was wore and adjusted on your head, the way that you changed the focus, the quality of the graphics, the visual look of the device except that it’s orange, game play style, even the bugs I encountered were the exact same as my Oculus Gear VR experience! 0 ★ for you for not have a single piece of innovation from your own work! Painting program, the lines were very smooth tracking with no issues, but visually cleaner that the Playstation VR Harmonix game. The controllers also looked like controllers in the game, very intuitive to use, a square of metro buttons displayed above the right controller, and you would rotate your hand to rotate the square for more button options. The left controller was used to aim and select the button options, and then for painting. Odd that they made everyone paint with their left hand, the guy before me switched his “left” and “right” hand to paint with his physical right hand. Space Shooter. I am standing on a planet, and space ships are flying around in space shooting at me. 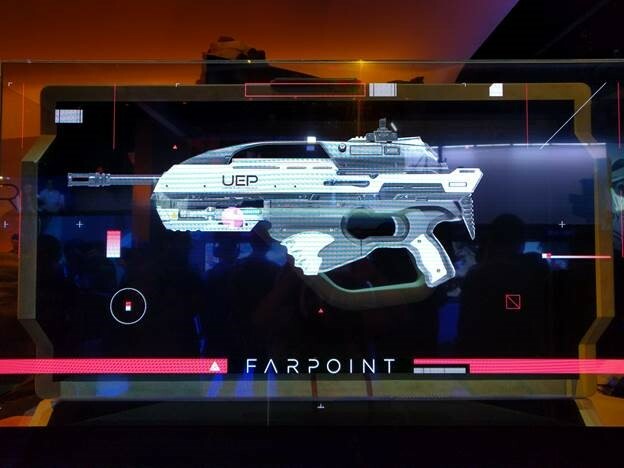 My controllers turned into guns (looked similar to the Halo guns) that were slightly larger than the physical controllers, but my hand was placed correctly for the triggers, and I could see my reload on my digital counters like a laser tag gun. I was bombarded with spaceships by level 4 that I was shooting arms open left and right, Matrix style. I could move around a lot to avoid the firing. This is some Kickstarter game for a multiplayer puzzle game. 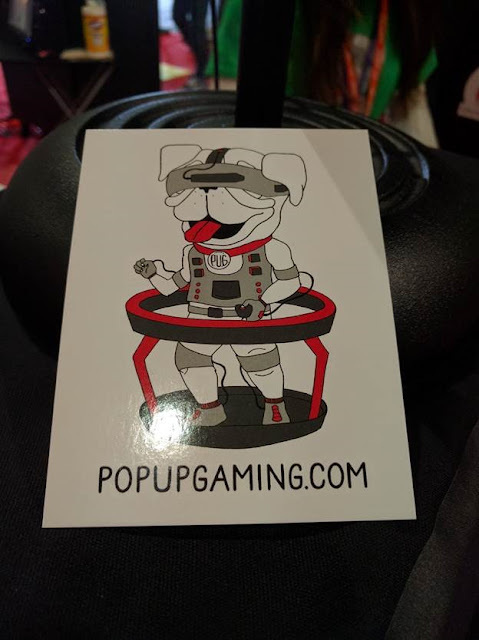 The logo confused so many people, “is this a dog game? Is this for dogs? Are you pretending to be a dog”, none of the above. In the game you move around different rooms to find puzzle pieces. You face the direction you want to go and push up on the trackpack of the Vive. It was easy to use, but the motions made me so motion sick I had a lay down after the demo. The graphics were still in the skeleton stages. The physical setup was interesting. You can see to avoid the cord problem they have the device cords above your head. But because were were actually turning in 360 directions to face which way to move on the map, I ended up moving around so much that the helpers had to stop me and move me back to center before I knocked over the whole physical setup. 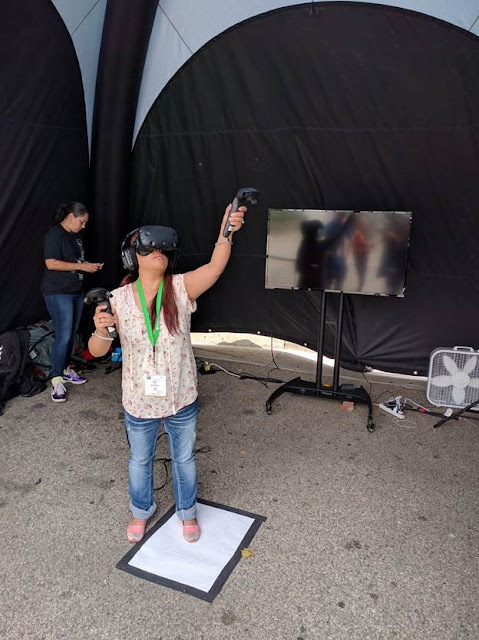 I was so excited to try this, but they had over 60 people in line and one demo station. Sorry too impatient to wait. When I walked up, one of the sales folks made sure to mention to me that “we have it from a Women’s perspective as well”. One of those small companies off to the side. 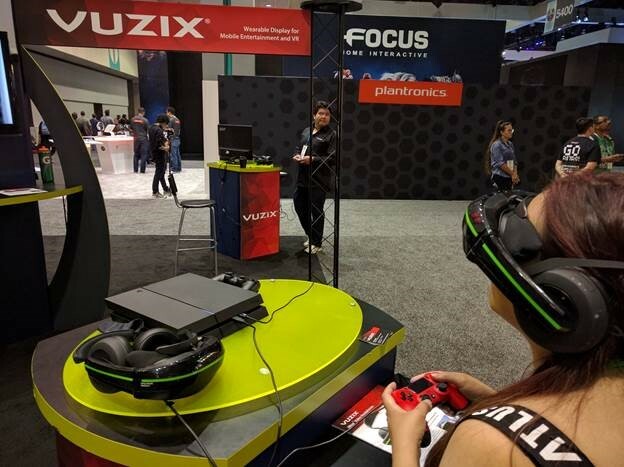 They make a balance board for the VR systems. So if you don’t want to walk or don’t have the space for it. You can use this board to simulate moving directions including up and down. To move up you have to lean your left foot forward and right foot backwards. It was kind akward. 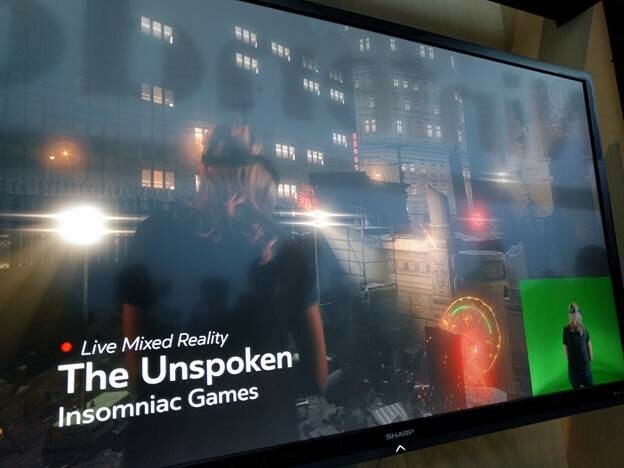 3D content, plugged into a PS4 and playing a 3D video game that was made for those oh so popular 3D TVs. It looked like I was looking at a 3DS super close to my face, yet I could still see the screen’s edges very clearly. VR Experience, it plays OSVR (universal open source VR ecosystem) content. 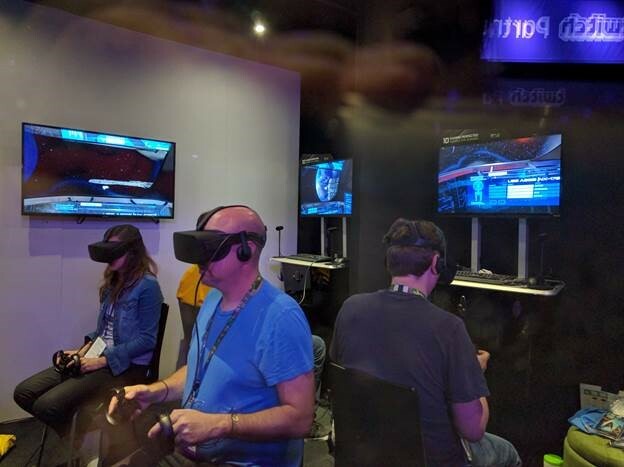 The head tracking was good, the graphics quality was actually better than PlaystationVR, but the fact I could see the bounding box of the screen just made me feel I was watching a movie theatre screen. 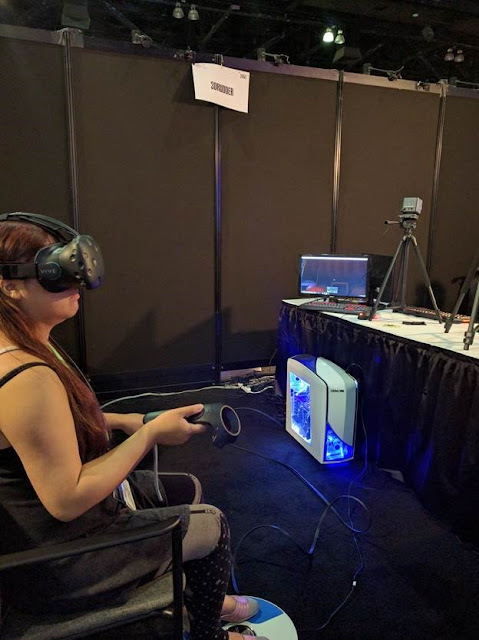 Unfortunately, I was too busy running to a demo appointment I wasn’t able to try this out. 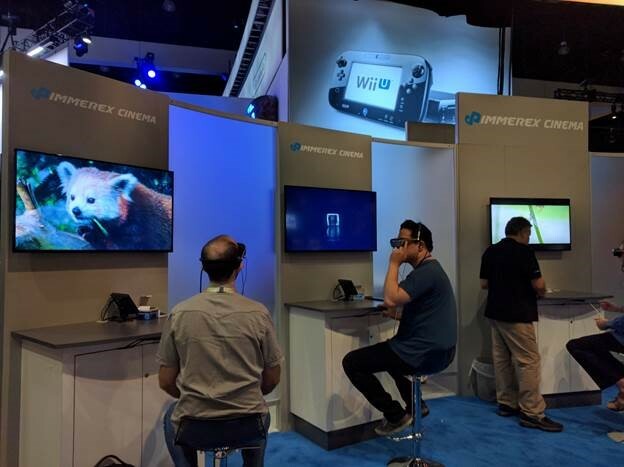 From what I quickly gather, it looks like they are focusing on video, not gaming.